NEW YORK, New York — The year of 2011 continues to be an extraordinary year for Togh, a village in Arsakh’s Hadrut Region. Thanks to the implementation of vital development projects by Hayastan All-Armenian Fund, Togh’s infrastructure is undergoing necessary improvements. In May, the Fund completed its reconstruction of the arts center and gymnasium at the community school, followed by the launch of rebuilding Togh’s potable-water system in June. 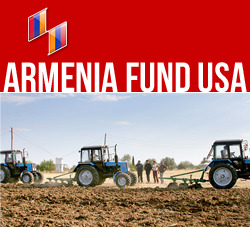 This June initiative is critical for the community and is co-financed by the Fund’s French affiliate as well as by the government of Artsakh. Within the framework of the project, the Fund will build an internal network, with a total length of ten kilometers, and a 150-cubic-meter reservoir. In addition, the village’s water-purification facility and pipeline will be refurbished. As a result, the nearly 200 households of Togh will have around-the-clock access to drinking water, a significant improvement in the community’s quality of life and chances of further economic development. After thanking the Hayastan All-Armenian Fund for transforming the community school into a beautiful and fully-appointed campus, complete with an arts center which now serves youths from neighboring villages as well, Shaboryan was happy to announce that currently the Togh kindergarten is being rebuilt, with financing from the government of Artsakh. “Water is central to the life of the village,” said Togh mayor Alexander Shaboryan. The reconstruction of the water system in Togh will enable its residents to live a healthier lifestyle. As clean water is made more readily accessible to residents of Armenia, healthcare within Armenia will improve as well. Togh has a population of about 750. Grape-growing and grain-cultivation are the main occupations of the villagers. Other residents are employed by local stone workshops or are engaged in the production of flour and pasta.